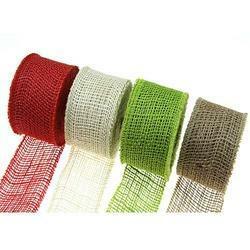 Pioneers in the industry, we offer jute ribbon for handicraft items from India. We are one of the widely acclaimed manufacturers, suppliers and exporters of Jute Ribbon for Handicraft Items. The offered jute ribbon for handicraft items are specially weaved for creating the handicraft items. Our supplied jute ribbons for handicraft items are easily available at very affordable and reasonably economic market selling price. Looking for Jute Ribbon for Handicraft Items ?